Before dawn broke on Tuesday, March 12th, buses around New York State loaded with over 700 yeshiva and day school students, faculty, parents, school officials and lay leaders from Westchester to Rochester, Brooklyn to Long Island, representing over 50 schools in the TEACH NYS network. All headed to Albany on an annual mission with a single cause: to increase equitable government funding for non-public schools participating in Science, Technology, Engineering, and Math (STEM) education and for additional security funding. 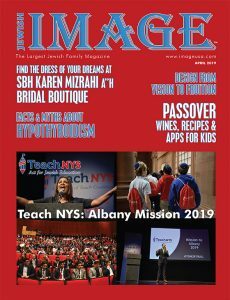 Teach NYS was founded in 2013 and was the first branch to open in NYS as a flagship member of Teach Coalition, which now has different member states. Part of a vast network of community leaders and parents across the county, participants work to keep costs down for sending children to non-public schools. A day of advocating, advocacy, and lobbying at Empire State Plaza had incredible impact on lawmakers across NYS. This was the largest day school group, including ten Sephardic schools, to descend on any State Capitol in the country and their legislators saw how seriously the Orthodox community seized the issue of better, safer, more affordable schools. Currently 450 days schools and yeshivas receive funding from Teach NYS’ efforts. The biggest issue students and community members stressed at meetings with elected officials that day was the need for STEM funding in nonpublic schools, a reimbursement program that started in 2017. The legislature approved 5 million initially to help non-public schools hire qualified STEM teachers. Last year, through Teach NYS lobbying, they tripled it to 15 million. They’re now asking for 91 million, which reflects the amount needed to fully fund NYS STEM teachers’ salaries based on 1,800 applications the NY State Department of Education received in August. This can help ease the financial burden and overall operating budget for schools. “We’re coming here today together and our prayers and voice are more powerful as a Jewish community when we work together,” said Moishe Bane, President of the OU. Sephardic community members took time off from work and running businesses to fight for funding. 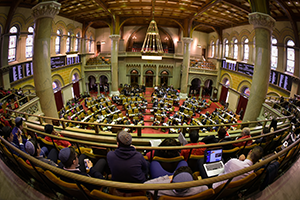 Two Brooklyn schools, Yeshiva of Flatbush and Magen David Yeshiva, sent students from their debate team and student council to express their concerns at lobbying meetings. Representatives from Barkai Yeshiva were present as well. At a lobbying meeting with Senator Julia Salazar’s Chief of Staff, Sutton said “Everyone in the room is a Sephardic Jew” and he “wanted to welcome her to the community.” The senator has publicly said that her father’s side of the family has some Sephardic ancestry. Student council members from Magen David spoke at that meeting about their current limitations of STEM funding, affecting younger grades that only have partial materials needed with only one lab per school. Students requested STEM education for young grades too, explaining that with labs, experiments and technology, they can apply to be successful in life by learning circuits, building websites or becoming architects and engineers. “I’m a big believer that we should be getting more money from the government for our community, whether it be for our schools or needy people,” said Abraham Sultan, a Sephardic community member who graduated from Yeshiva of Flatbush, where his children now attend. He has paired up with NYS Assembly Woman Alicia Hyndman to help this cause.